Produced from early-harvest 100% organic Maurino olives grown from trees in Tamia's Ucciano grove in Tuscia, this extra virgin olive oil has an intense fruity flavor that begins sweet, and then gains a balance of bitterness as the taste of freshly cut grass expresses itself. Hints of green tomato and fresh almond arrive at the finish, making this oil delightful with bean salads and grilled white meats. It also makes a fine accompaniment to shellfish, grilled mushrooms and soft cheeses. From the area of Tuscia, to the northeast of Rome in the province of Lazio, Tamia continues the regional traditions of producing quality olive oil in their unique and nutrient-rich volcanic soil. 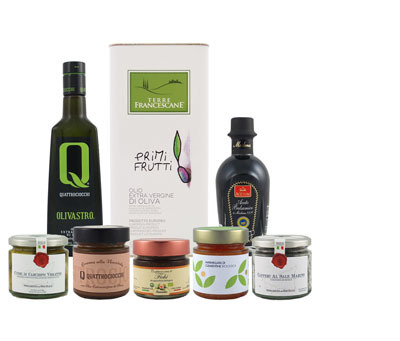 While leaning on their distinct local olive variety, Caninese, Tamia also produces an organic Maurino monocultivar oil, and extra virgin blends that incorporate the more common Frantoio, Leccino and Moraiolo varieties. The company has its roots in Tuscia dating back to 1928, with the founders studious ways leading them to focus on quality, and eventually convert to entirely organic production by the end of the 20th century. The Tamia brand was born in 2012, and it has since won many awards, both in Italy and across the globe, including best Organic Delicate EVOO at the New York IOOC. An elegant, complex and balanced oil from Taggiasca olives grown on the Cassini family farm. An organic olive oil pressed from three native olive varieties of Tuscany.